When entertaining for a crowd, cocktail-size empanadas are a great finger food to serve. You can stuff them with all sorts of fillings and you can make a batch ahead of time, freeze them, and re-heat them straight from the freezer when you’re ready to serve. 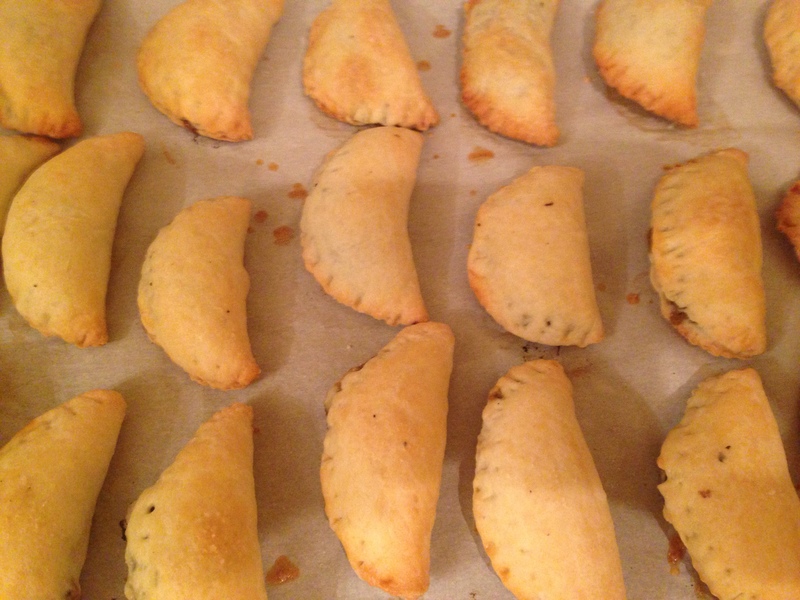 These mushroom empanadas are baked, not fried. The dough recipe comes from Claire Archibald of Café Azul in Portland, Oregon as written up on Epicurious.com. It’s a great pastry dough recipe that is really easy to make. Just mix the flour, salt, butter in a mixer with a dough hook then beat one egg with one tablespoon of Champagne vinegar, or I used rose’ wine vinegar which is lighter than red wine vinegar but not as a expensive as Champagne vinegar, and fill the rest of the cup with cold water, then add to the dough and mix through. Wrap the dough in plastic and chill for an hour. You will use about 2/3 of the dough for this recipe. The remaining dough can be frozen. While the dough is chilling, you can make the mushroom filling. This recipe call for portabella and shiitake mushrooms, for a full bodied-mushroom flavor. Shallots, sherry, and a hint of cream bring out the full flavor without taking away from the mushroom taste. Add the shallots and parsley to a food processor and process until the shallots are fine. 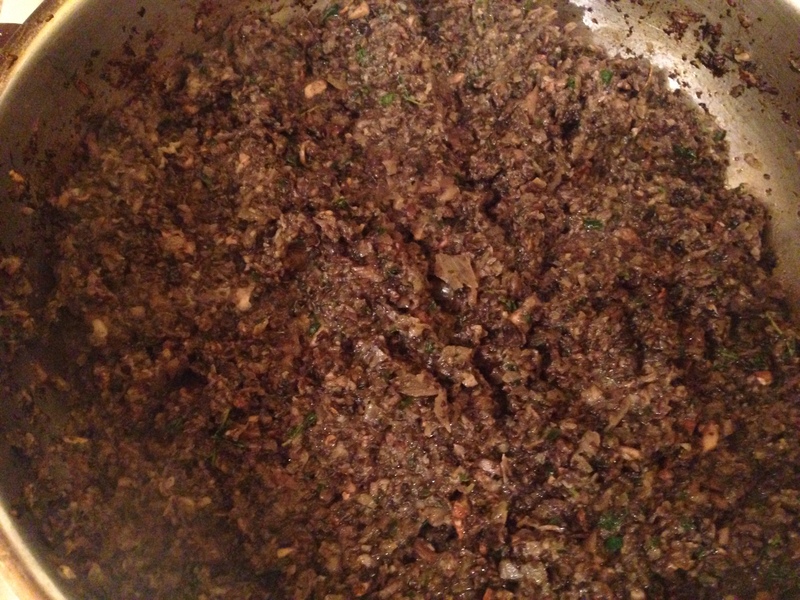 Remove the mixture and then add the mushrooms and process until fine. Heat oil in a pot and add the shallot-parsley mixture and a grated garlic and sauté for 3 minutes until the shallots are translucent. Add the mushrooms, salt, pepper, cayenne to the shallots, mix through and cook for 3 minutes. Add sherry, mix through and cook for 2 minutes, then add cream, mix through and cook for 1 minute. Remove mixture from heat and let cool. 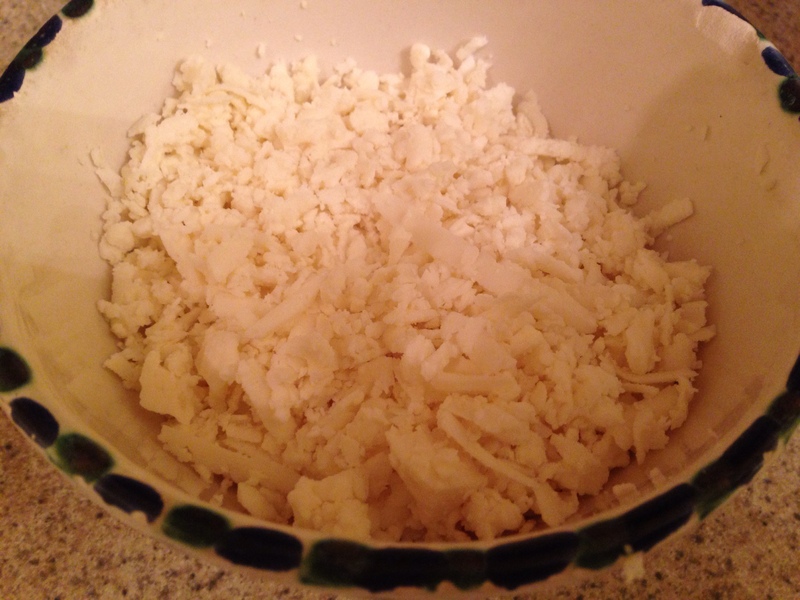 Queso fresco is a Mexican cheese that is very mild in flavor and crumbly in texture. 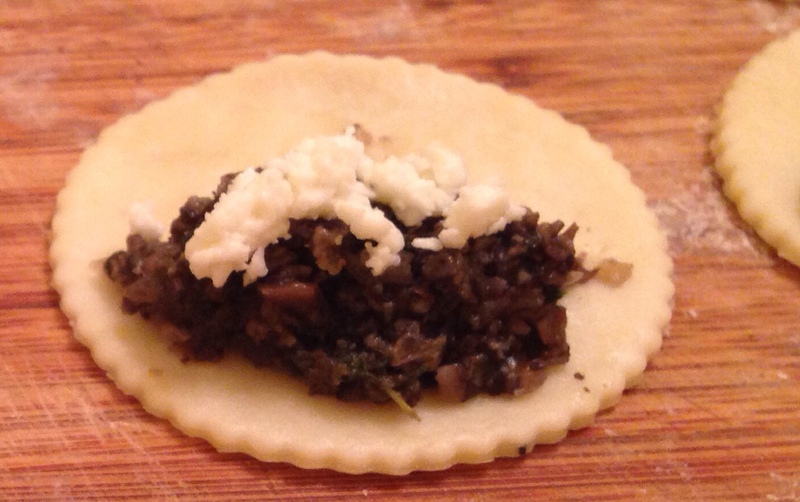 It pairs very well with the mushroom mixture in these empanadas. To grate the cheese, use a course grater but know that some of the cheese will fall apart and crumble as you’re grating. This is perfectly fine and usable in the empanadas. When the dough is chilled, cut it into sixths so it is easy to manage. Take one sixth and roll out dough into a thin layer – no more than 1/8” in thickness. Keep the remaining dough in the refrigerator until ready to use. Using a 2.75” diameter cookie ring, cut circles out of the dough, reusing the scraps around the circles for additional empanadas. To fill the empanada, use a regular teaspoon – not a measuring teaspoon – for portioning out the mushroom mixture and place mixture in center of disc. Be careful to not overstuff the empanada; a little filling goes a long way. Add a bit of grated cheese on top. To seal, press the edges of one side and work around the half-moon shape to the other side. Then, using the back of a fork, press the tongs onto the edges of the empanada to crimp, turn the empanada over and repeat the crimping. Place on a parchment paper-lined baking sheet and repeat the process. Brush the empanadas with the egg wash and top with a bit of salt before baking at 400° for about 23 minutes – might be 25 minutes depending on your oven. The cooked empanadas can be frozen. To reheat, taken them directly from the freezer and place in a pre-heated 350° oven for 10 minutes. Make dough by adding flour, salt and butter to a mixer with a dough hook and mix through until the dough forms. Then beat one egg and one tablespoon of vinegar and fill the rest of the cup with water, then and it to the dough and mix through. Wrap the dough in plastic and chill for at least an hour and up until 6 hours. 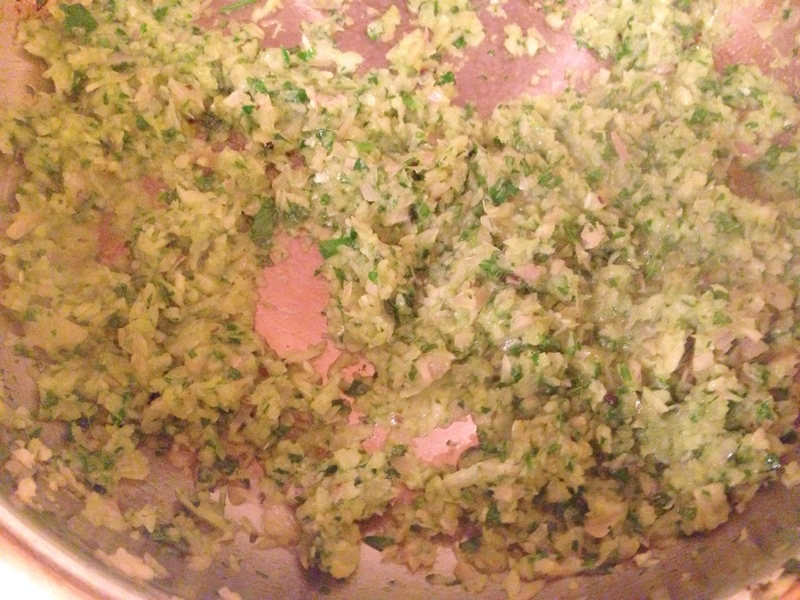 For the filling, add shallots and parsley to a food processor and process until the shallots are fine. Remove the mixture and then add the mushrooms and process until fine. Heat oil in a pot and add the shallot-parsley mixture and garlic and sauté for 3 minutes until the shallots are translucent. Add the mushrooms, salt, pepper, cayenne to the shallots, mix through and cook for 3 minutes. Add sherry, mix through and cook for 2 minutes, then add cream, mix through and cook for 1 minute. Remove mixture from heat and let cool. In a separate bowl, grate the cheese. To fill the empanada, use a regular teaspoon – not a measuring teaspoon – for portioning out the mushroom mixture and place mixture in center of disc. Add a bit of grated cheese on top. To seal, press the edges of one side and work around the half-moon shape to the other side. 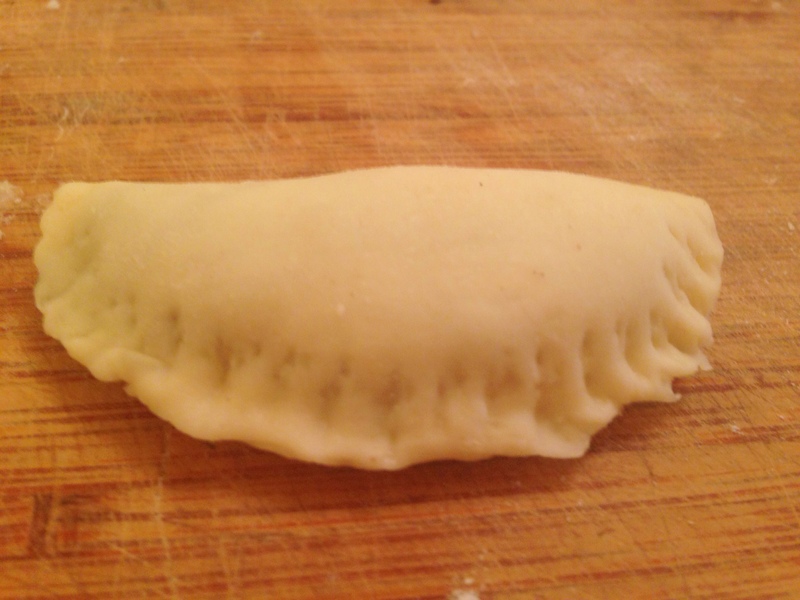 Be careful to not overstuff the empanada; a little filling goes a long way. Then, using the back of a fork, press the tongs onto the edges of the empanada to crimp, turn the empanada over and repeat the crimping. Place on a parchment paper-lined baking sheet and repeat the process. Brush the empanadas with the egg wash and top with a bit of salt before baking at 400° for about 23 minutes until lightly browned on top. You might need to cook 25 minutes depending on your oven. 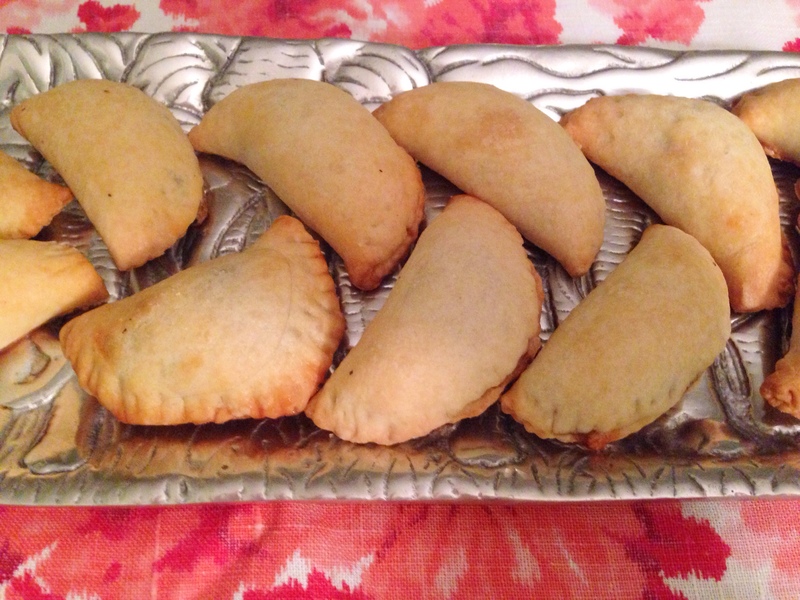 This entry was posted in Blog, Recipes and tagged empanadas, Mushrooms, Portbella Mushrooms, queso fresca on December 1, 2014 by Leslie.